Asheville, NC – March 17, 2016 – PointClickCare, the leading cloud-based software platform for the long-term and post-acute care continuum, announced today at theAmerican Medical Directors Association (AMDA) Annual Conference that it has joined forces with GEHRIMED, the creator of the first Stage-2 Certified Electronic Health Record (EHR) designed exclusively for post-acute care medical providers, to deliver a nationwide solution for the post-acute care physicians and care centers they service. This leading-edge solution will be the first to enable real-time patient data exchange between the physician’s EHR (GEHRIMED) and the care provider’s EHR (PointClickCare), helping care teams across the continuum to connect seamlessly, while leveraging the industry’s latest standards and technology innovation advancements. This effort is in direct response to care providers’ need for a comprehensive and secure solution that supports the integration of teams across the senior care continuum. With the joint solution, care providers will be able to view charts, electronically co-sign and prescribe orders, and seamlessly access and share critical clinical and care documentation, helping to strengthen the communication between physicians, care communities and pharmacies. Together, PointClickCare and GEHRIMED are helping to connect care teams, enhance clinical decision-making, streamline the care delivery process, and helping providers meet Stage 2 Meaningful Use requirements. 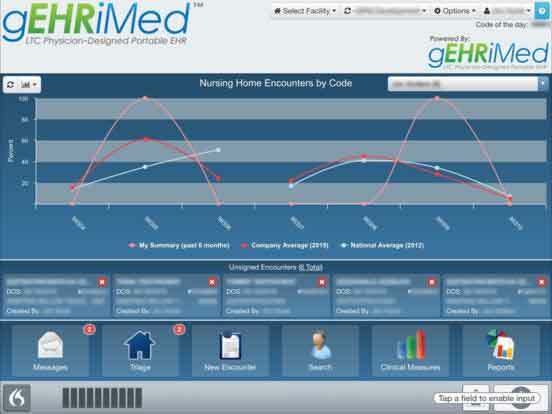 Both PointClickCare and GEHRIMED are exhibiting at AMDA March 17-20 in Orlando, Florida, providing attendees with a first glance into a true post-acute care EHR solution that empowers greater cross-continuum care. To learn more about PointClickCare’s Practitioner Engagement offering, and how it can help your organization achieve better connected, better quality care, click here.